From the time I was a small child, and old enough to be cerebral, I always believed, and knew deep in my heart that we are not alone. Whether God, as we know his infinite greatness, is the reason for our existence, or, the Big Bang Theory. I know that the majesty and wonder of existence cannot be solely ours. There must be other life elsewhere in the vastness of space. If only we as a civilization were advanced enough to propel ourselves out into the great unknown. Imagine what we'd find! Christopher Columbus would have nothing on us. And hopefully, that which we would discover would be cherished, rather than destroyed as with past generations on Earth. 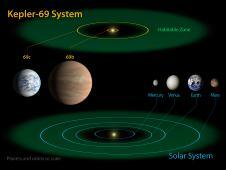 Relative sizes of Kepler habitable zone planets discovered as of April 18, 2013. Left to right: Kepler-22b, Kepler-69c, Kepler-62e, Kepler-62f, and Earth (except for Earth, these are artists' renditions). Image credit: NASA Ames/JPL-Caltech. Click for multiple resolutions and caption. 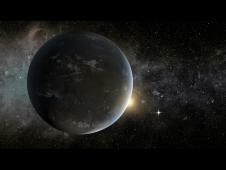 The artist's concept depicts Kepler-69c, a super-Earth-size planet in the habitable zone of a star like our sun. 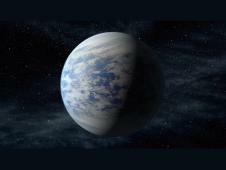 This artist's concept depicts Kepler-62e, a super-Earth-size planet in the habitable zone of a star smaller and cooler than the sun, located about 1,200 light-years from Earth. 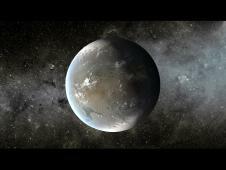 This artist's concept depicts Kepler-62f, a super-Earth-size planet in the habitable zone of its star. The diagram compares the planets of the inner solar system to Kepler-62, a five-planet system about 1,200 light-years from Earth. 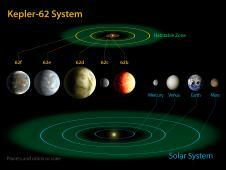 Much like our solar system, Kepler-62 is home to two habitable zone worlds. The small shining object seen to the right of Kepler-62f is Kepler-62e. 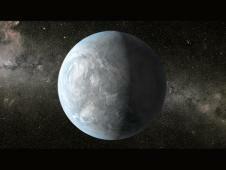 Orbiting on the inner edge of the habitable zone, Kepler-62e is roughly 60 percent larger than Earth. MOFFETT FIELD, Calif. -- NASA's Kepler mission has discovered two new planetary systems that include three super-Earth-size planets in the "habitable zone," the range of distance from a star where the surface temperature of an orbiting planet might be suitable for liquid water. Click here to go to a site with downloadable video.